POLLUTION or DISTURBANCE of any waterway or watershed is a serious violation of the Pennsylvania Fish and Boat Code that must be recognized and reported to a PFBC Regional Law Enforcement Office. The law provides for criminal penalties for pollution or disturbances. 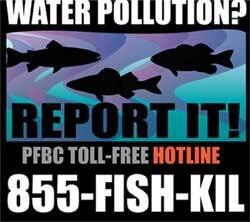 POLLUTION is an introduction into any waterway of anything that “might” harm or kill fish. Examples of “pollutants” are: Electricity, explosives, sediment runoff, sewage, insecticides, poisons, high volumes of extremely hot water, liquid concrete or cement, paint, chemicals, petroleum products like gasoline or oil, brine runoff from gas or water well drilling and manufacturing waste. DISTURBANCE of waterways or watersheds includes any alteration of a waterway, its banks, bed or fish habitat that “might” cause damage to or kill fish. changing the channel flow of a waterway. Various types of permits are required for any such work. If you see anything suspected to be a pollution or disturbance of any waterway, regardless of how seemingly insignificant, report it immediately by calling the local Pennsylvania Fish & Boat Commission regional law enforcement office (business hours) or the Pennsylvania Department of Environmental Protection at 1-800-541-2050 (24 hours a day, 7 days a week).